It's not every day that scientists identify a brand new species of mammal. Rarer still is a confirmed discovery of a new species of primate — the mammalian order that encompasses humans, monkeys and apes. Now, for only the second time in 28 years, a new species of monkey has been identified in Africa. Oh, and it looks exactly like Wash from Firefly. 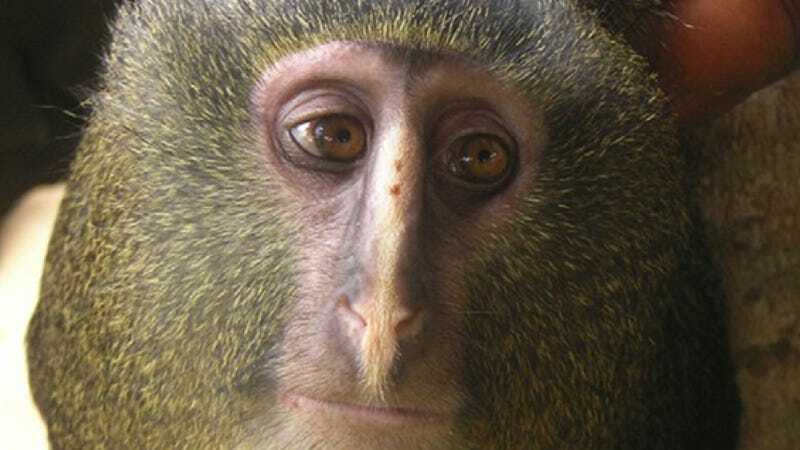 Yale conservation biologists John and Terese Hart have dubbed the new species Cercopithecus lomamiensis; but to the Mbole people of the Democratic Republic of Congo, the monkey is known as "lesula". The Harts, and others, often refer to it by this vernacular name. In the latest issue of PLoS ONE, the Harts and their colleagues describe the lesula as having "a mane of long grizzled blond hair," that "frames a protruding pale, naked face and muzzle." More distinct in some members of the species than others is a cream-colored nose stripe, which runs vertically down the monkey's face. [The species] lives both on the ground and in trees in a 6,500 square mile habitat of the lowland rainforests in the centre of the DRC between the middle Lomami (the inspiration for the species' name) and the upper Tshuapa Rivers. Its diet is mostly fruit and vegetation. [The Harts] first saw the species in 2007 at the home of a primary school director, who was keeping a young female in the town of Opala. Later that year, the team found the species – which is similar in appearance to the owl-faced monkey (Cercopithecus hamlyni) but with different colouring – in the wild. Genetic tests later verified it was a new species. Alright. I think that's enough doppelgänger-ing. The Harts' work on the lesula is published in the latest issue of PLoS ONE, but those looking for a more approachable introduction to the new species should check out Searching for Bonobo in Congo, a fantastic blog — maintained by Terese Hart — dedicated to cataloguing the efforts of her and her team to establish more effective wildlife protection measures throughout critical conservation regions of the DR Congo. Her latest blog entry, posted just yesterday, serves as a great introduction to this new species of monkey from the center of Congo, and includes some beautiful photos. Go check it out.